Rangers' Mark Warburton is the Scottish Championship manager of the month for January. And Ibrox striker Kenny Miller has picked up the division's monthly player prize from sponsors Ladbrokes. Former Scotland international Miller, 36, scored five goals in January, including a hat-trick in a 6-0 success at Dumbarton. 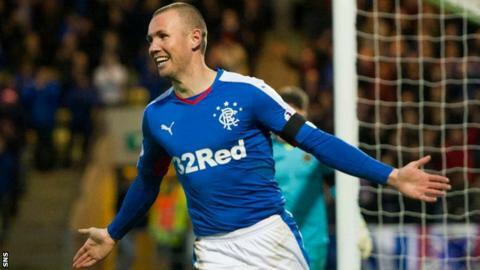 Rangers are on a seven-match winning streak since a 2-1 defeat away at Falkirk on 19 December. Warburton's side lead the Championship by eight points, having played a game more than nearest rivals Hibernian. The manager believes his side have fixed their vulnerability to counter-attacks without losing their sense of adventure. "We saw games where teams had nine or 10 men behind the ball and it's very hard to break down," he said. "We had to show patience and when we didn't show patience and lost our shape, we were vulnerable. "We had some work to do and the players have been tremendous in that respect." "We scored four against Hibs and six and five in the weeks after that, so I don't think we have curbed our attacking instinct, but we have become tighter and more focused on what we have to do without the ball." Rangers host Kilmarnock on Saturday in the Scottish Cup and will hope to improve on the 3-1 defeat suffered there against another Premiership side, St johnstone, in the League Cup in September. "We were well equipped that night," insisted Warburton. "That night, we made a couple of mistakes and got punished for it. "Other times, that's not been the case, other times we have put our chances away. "Sometimes we win by four or five or we sneak a late goal. There is no great gulf in my mind, far from it. "We're in good form, we are at Ibrox, we are Rangers, and we go into the game full of confidence."